You've probably seen photos of Burano, the picturesque island in the northern Venetian Lagoon, famous for its brightly colored houses and handmade lace. 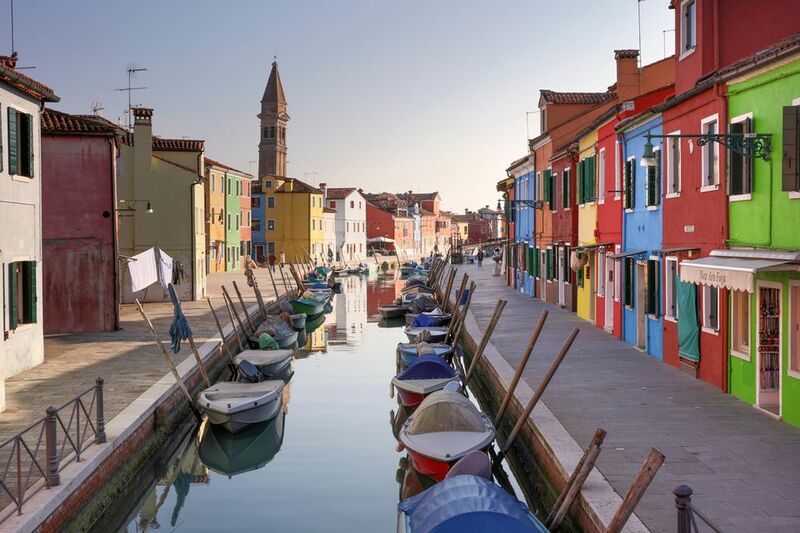 With a very different feel and far fewer crowds than Venice, Burano makes a great day trip from La Serenissima, but we also recommend it for a night or two, especially if you want to see another side of life on the Venetian Lagoon. Although earlier Roman remains have been found on Burano, the island was permanently settled in the 6th century by people fleeing hostile invaders on the mainland. Burano was and is a fishing village whose residents have always relied on the lagoon for sustenance. The neighboring island of Torcello was politically and strategically more important (now it's nearly abandoned), but Burano rose to prominence in the 1500s, when its lacemaking traditions were born. For centuries, women made the intricate handmade lace, which was in high demand across Europe. Lacemaking waned in the 1700s but was revived in the late 1800s. Today, while Burano is famous for its lace, there are only a handful of traditional lacemakers remaining on the island (see below). Burano's brightly colored houses line its boat-filled canals. The tradition of painting houses in this manner is said to relate to the island's heritage as a fishing village—the bright colors made it easier for returning fishermen to find their homes in the thick fog of the lagoon. It is also said that the Burano residents favor the bright paint as a well of marking where one property ends and another begins. Today, Burano is still a quiet village of about 2,000 full-time residents. Its main industry is tourism, with day trippers from Venice coming to buy lace and photograph the colorful and picturesque canals. Via Galuppi, the island's main street, is lined with pastry and souvenir shops, stores, bars, and restaurants. If you wander away from that area you'll see fewer tourists and can enjoy the peacefulness and beauty of the canals and colorful houses that have long attracted painters to the island. The island is also famous for its incredibly delicate, intricate handmade lace. Unfortunately, a lot of stores sell cheap imitation lace, much of it made in China. The first clue: if it's inexpensive, it's not the real thing. Even the smallest piece of real Burano lace takes weeks to finish—a tablecloth can take a team of women up to a year to complete. We recommend you start with a visit to the Museo del Merletto, the lace museum, to learn about the craft, then visit one of the real lace shops on the island. The lacemakers at Martina Vidal have been tatting for four generations, and the atelier has three floors of lace clothing, housewares, and gifts. You can also see the craftswomen at work. Emilia Burano is also recommended for authentic lace. Remember, the real thing is not cheap—even the smallest item, like a handkerchief or doily, will cost 45 euros and up. Burano also has a leaning tower, the former bell tower of the 15th century San Martino Church, which is a great spot for pictures. To learn more about the history and way of life on the lagoon, you may take a boat tour with Domenico and Enrico of Pescaturismo Nettuno. Both are fishermen who are deeply committed to preserving the natural beauty and native traditions of Burano and the lagoon, and a ride in their authentic bragosso fishing boat is a terrific experience, as well as a way of supporting sustainable tourism on Burano. Burano has several good restaurants specializing in fresh seafood. The most famous is Trattoria al Gatto Nero, known for its cerulean blue facade, handmade pasta, and homey atmosphere. Trattoria da Primo e Paolo, right on the main square, is famous for its seafood risotto, as is Trattoria da Romano, also on the square. Riva Rosa is also recommended and has a rooftop terrace with swoon-worthy lagoon views. For a more exclusive experience, cross the footbridge to Mazzorbo Island and Venissa Restaurant, a Michelin-starred restaurant set in a walled vineyard and garden. It's part of Venissa Wine Resort, which also offers a cozy osteria and bar, premium wines, and polished modern rooms for an overnight stay. There are numerous Airbnb options on Burano, but the island's only hotel is Casa Burano, which offers sleek modern rooms spread out over three traditional, colorful houses. Spending the night on Burano is a magical experience—after the daytime crowds head back to their hotels in Venice, the canals of Burano turn to glass, residents come out to talk and play cards, fishermen tend to their boats, and church bells call worshippers to mass. It's a quiet, authentic side of Venice that few tourists take the time to see. Burano, after all, is an island, so other than a costly private taxi from Venice, the way to get there is to take Vaporetto number 12 from Fondament Nove, departing every half hour. The Vaporetto also makes one stop on Murano Island, so if you reach Murano from another part of Venice, you can transfer to number 12 at the Murano Faro stop. On the scenic 40-minute ride, you'll pass the cemetery island of San Michele, Murano and other small islands in the lagoon. The cost of a one-way ride is currently 7.50 euros, or you can buy a 12-hour island pass for 20 euros, good if you plan to visit more than one island. There are also passes valid for longer periods of time. For more information on fares, visit Mouversi a Venezia, or check out our guide to transportation in Venice. From Burano, it's a short boat ride on Vaporetto line 9 to Torcello, a peaceful island whose cathedral has stunning Byzantine mosaics.